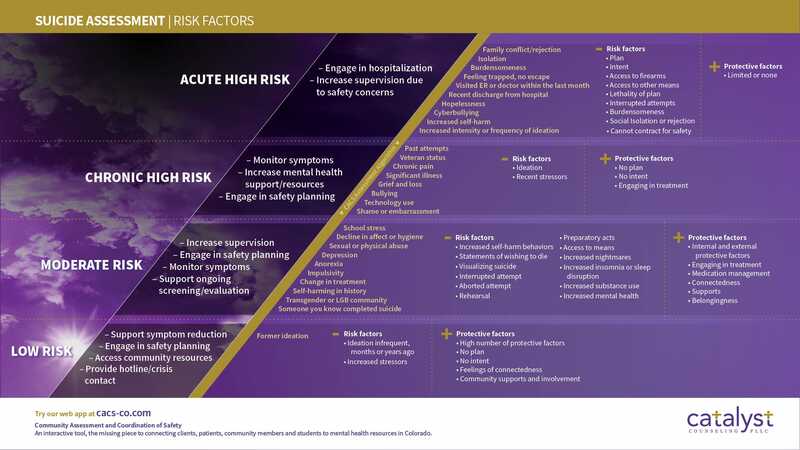 The following resource sources were factored into the CACS ® algorithm to calculate suicide risk. Alter, Adam L. Irresistible: the Rise of Addictive Technology and the Business of Keeping Us Hooked. Penguin Books, 2018. Erbacher, Terri A., et al. Suicide in Schools: a Practitioner's Guide to Multi-Level Prevention, Assessment, Intervention, and Postvention. Routledge, 2005. Freedenthal, Stacey. Helping the Suicidal Person: Tips and Techniques for Professionals. Routledge, 2018. Flemons, Douglas G., and Leonard M. Gralnik. Relational Suicide Assessment: Risks, Resources, and Possibilities for Safety. W.W. Norton & Company, 2013. Joiner, Thomas E. Why People Die by Suicide. Harvard University Press, 2005. Shea, Shawn C. The Practical Art of Suicide Assessment: a Guide for Mental Health Professionals and Substance Abuse Counselors. Mental Health Presses, 2011. Twenge, Jean M. IGEN Why Today's Super-Connected Kids Are Growing up Less Rebellious, More Tolerant, Less Happy-and Completely Unprepared for Adulthood and (What This Means for the Rest of Us) Atria Books, 2017.